This is a dish that has been passed down through the family. It probably exists somewhere in the culinary world - I've not seen it published - so I put it here for your consideration. My MIL called this hash; you can see from the pix, it's not really a hash. now, to be perfectly honest, at the time I was more interested in chasing her daughter than learning her cooking. so this is my own "perfecting" of her dish. forty-six years later, I've still got my hands on her daughter, but it's taken me a while to translate success with this dish from accident to sure-thing. of advantage is the "one pot" approach. brown the meat, remove, sweat down the onion, add back beef & liquids; cool, refridgerate-in-the-pot, reheat . . . minimal muss and fuss. do note the braise then cool then refridgerate then re-braise - a two day timeline. I've tried doing this all on "same day." it works, but cooling and reheating the beef in the braising liquid the second day is far far superior. the beef: a top round cut work well with this dish. alternatively a chuck cut. I prefer a two pound / 1 kg top round - which is way more than two empty nesters can eat, so I buy a roughly two pound cut, lop it in half, freeze one piece for later. 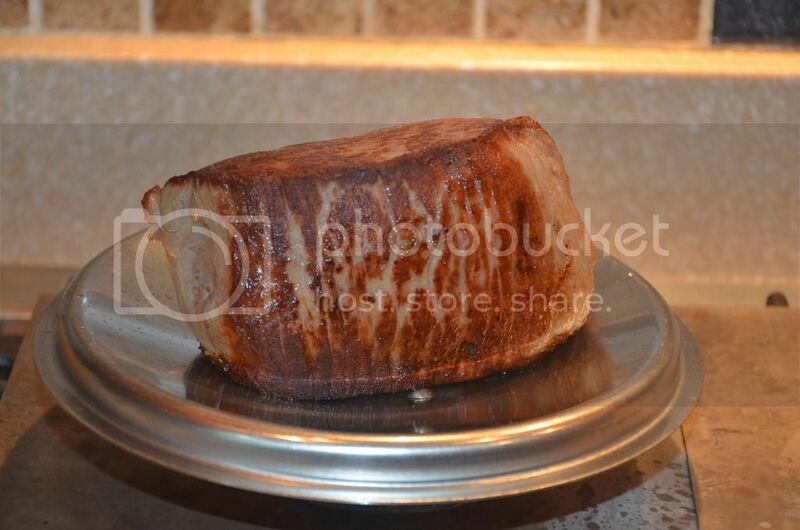 the pix is about a one pound / 500 g chunk of top round. brown the meat. a heavy sear is okay/preferred as this is going for a long long braise; the "color" gets washed off. 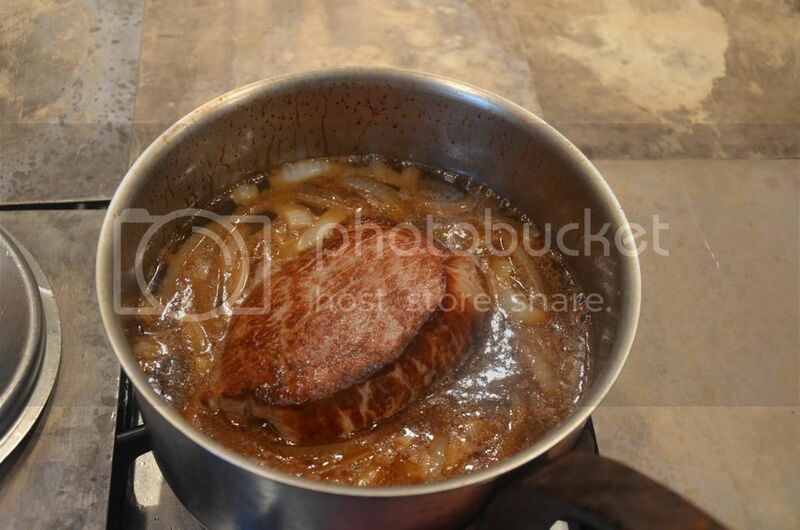 depending on the amount of surface fat on the beef, use an oil in the pan to facilitate the browning. 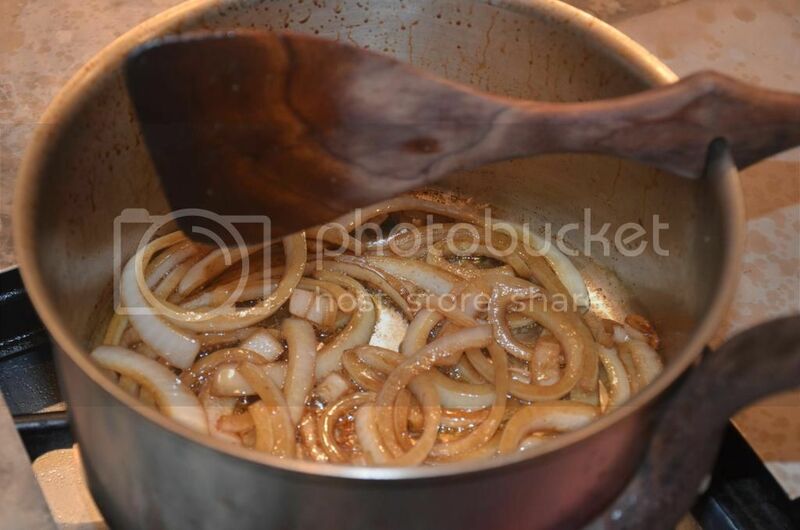 after the meat browning / searing, remove beef, put onion in pan and sweat down the half-moon sliced onion. half a large onion per pound / 500 g of beef. add oil if needed; salt and fresh ground pepper the onion mix. when the onion is done, put beef back in pot, add 12 fluid ounces / 350 ml of a decent beer; add water to 70-80% of meat "height/ depth" in the pot. cover, increase heat to get the liquid to a boil. immediate reduce heat and simmer as low as possible for four hours. with a gas stove, I use a flame tamer to minimize the simmer, even on the smallest burner. after a four hour simmer, remove from heat and allow to cool. put in the fridge (covered) overnight. can keep 3-4 days. final prep is 3 hour very low simmer. if you're a fan, added sliced mushroom at start of simmer. check mid-way for salt&pepper. obviously additional seasoning can be used - anything you like that does beef well. 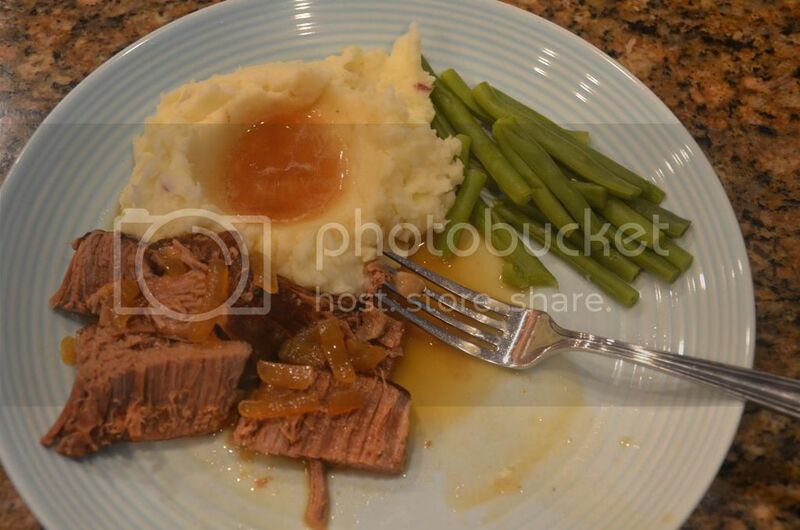 the pix shows a plain ole' dinner knife which separated / pulled the beef apart. the beef is like butter - no knife required. you can cut it with a fork to bite size. fret not any left overs. 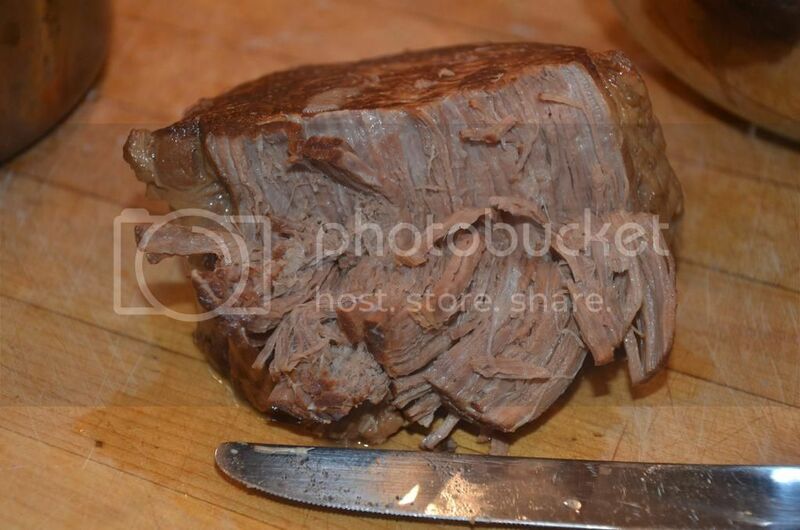 sliced across the grain it makes a spectacular roast beef sandwich. or thicken up some gravy for a hot roast beef open face sandwich on a sturdy bread.